Last Updated: 30 Oct 2014. There are two kinds of communication namely, interpersonal and mass communication. There are several media for mass communication. The post, telegraph and the telephone are the important means of communication. Radio, television, newspaper, journals and magazines are the other media. 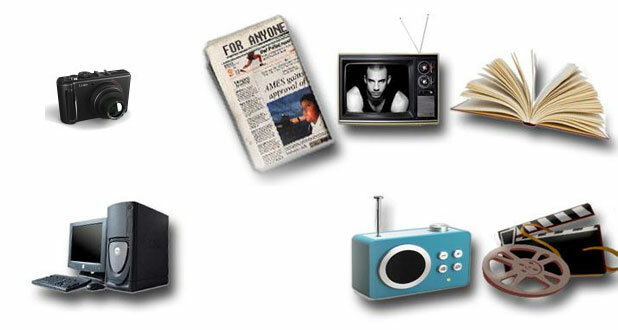 With the introduction of portable transistors, the radio has become the common mass media. According to the All India Radio, the AIR reaches about 200 million people. Hence, it is the most effective medium. Though the radio broadcast includes programs for family welfare, for youth, for the farmers and on education, health and hygiene, it is used mainly for listening to film songs. The media which is next in importance and popularity is the television. In India the state owned television is known as Doordarshan. It reaches about 78.7% of Indian population through 534 transmitters. It transmits news, current affairs, educational programs, dramas, films and world affairs. We not only listen to but also see what happens in any remote part of the world at the same instant. Here again it is used only as an entertainment medium. But in advanced countries, major operations are telecast live for the benefit of others. With the advent of private televisions, the T.V. has become the main medium for advertisement and cheap entertainment. The newspapers and journals form the cheapest and the largest media. India publishes 27,000 newspapers, 2538 journals in about 93 languages. The circulation is estimated around 58 million. These papers and magazines cater to the needs of its subscribers. But it is useful only to the literate population. They do not reach the remote rural places. One advantage is they are not controlled by government as in the case of AIR and Doordarshan. By Sindhu / In Hydrabad..
Now a days the quality of the news in the news channels is reducing. It is completely focussing on one topic and wasting the time discussing with politicians. It is having more negative impact. useful programs for the students are reducing.now a days is used for advetisements only.They are providing news inorder to increase their ratings.